For the first two years of service following construction an aerobic OSSF system, the system must be covered by a maintenance contract. OSSFs providing nitrogen reduction must be covered by a maintenance contract in perpetuity. OSSF systems proving aerobic treatment and serving commercial sites must be also covered by a maintenance contract in perpetuity. Systems providing primary or anaerobic treatment do not need to be covered by a maintenance contract at anytime. Homeowners of a single-family owner-occupied residence that have obtained the necessary training and are registered with Austin Water (see maintenance forms for homeowner maintained systems for more information, below) may maintain their own aerobic treatment system after the initial two year maintenance contract has expired. Beginning November 12, 2014, owners of a single-family owner-occupied residence (Homeowners) may only maintain their OSSF if they have taken and passed the test required for a TCEQ registered maintenance technician, 30 TAC Chapter 30, Section 30.245(b) or obtained equivalent training as determined by the City. Homeowners who maintain their own aerobic treatment system must be registered with the City. In order to be registered with the City, a homeowner must complete and submit the Registration Form for Property Owners Maintaining On-Site Sewage Facilities to this office for review and approval. 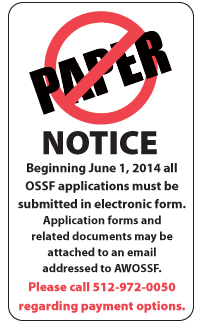 Homeowners maintaining their own OSSF must record their maintenance activities using the Homeowner Reporting and Testing Record Form. This form may be completed electronically and submitted to Austin Water as an attachment to an e-mail, please see form for more information.